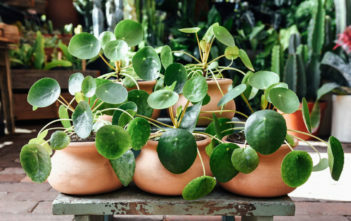 You are at:Home»Archive for "Pilea"
Pilea, with 600 to 715 species, is the largest genus of flowering plants in the Nettle family (Urticaceae). It is distributed throughout the tropics, subtropics, and warm temperate regions (with the exception of Australia and New Zealand). The majority of species are succulent shade-loving herbs or shrubs. The genus name is derived from Latin “pileus”, meaning “felt cap”, because of the calyx covering the achene.